Continuing some of my coverage from SGC2013, I spent a good amount of time in the "Indie Heaven" segment of the con. For the folk who weren't able to make it, "Indie Heaven" was where several indie studios gathered to share their blood, sweat, and tears with many a gaming enthusiast. It was hard to really pick just one to dig on as much as I dig, games such as Mechknight Chronicles, Mist of Stagnation, and Rush Bros are some notable examples of awesome gaming experiences. But one game stood out from the crowd, heavy bass and infectious music poured out from this little corner of the hall. Here is where Michael Todd Games was showing off their latest project, a beautiful game with a truly unique art direction, Electronic Super Joy . Upon first loading the game, the unique art style is thrown right into your lap. 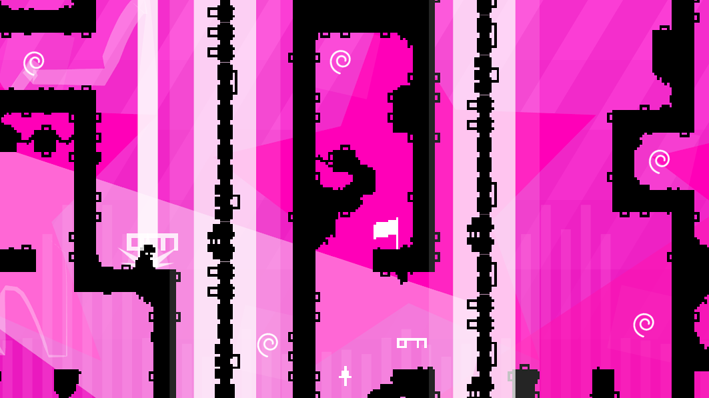 Bright and vibrant backgrounds with elements of the level design in a stark black. It's like Limbo , but except in place of the dark ambiance and frightening setting, you have bright colors and catchy music. All these elements, on their own, may seem a bit distracting... but put them together and we have a game that clearly lives by the credo of games being works of art. At its core, the game is a platform game with a clear goal, make it from point A to point B. In your way are some deadly obstacles along with the looming fear of an imminent fall to your death. This game is hard, very hard. Personally I prefer a game that pushes me, the challenging nature of this game is very welcome, while many games these days seem to trade challenge for accessibility, I'm glad some some developers out there will still take it upon themselves to kick the collective asses of gamers. You will die multiple times and what's best is that each time you fail, you learn a little bit and can eventually get past whatever obstacle are in your way. Music is one of the most unique elements of this game, while not the first game to incorporate music, the soundtrack is itself a part of the overall level design. You can see how elements of the level follow every drum and snare, it's just as much important to have strong hand/eye coordination as it is to be able to follow the beat. Like a rhythm game that can also send you to a gruesome death... kinda dope! After thoroughly playing the game, I took a few minutes to chat with Cassie Chui the level designer and pixel artist for the game. Absolutely charming and truly passionate about this project, it was a delight talking about this awesome game. Check out our interview. Release is tentatively set for this coming Winter and right now you can download the beta for $4.99 from their website. The beta also acts as a sort of "pre-buy" for the game, when the final build is launched, those who have bought the beta will get the game for no additional charge. Keep an eye on our Facebook page because soon we will be giving away a copy of the beta for one of our Lifted Fans, can't say we don't love our g33ks. Check our the game's official website for details and also like them on Facebook. Oh, and do you dig the music? Check out ENVY as well. Get Lifted.